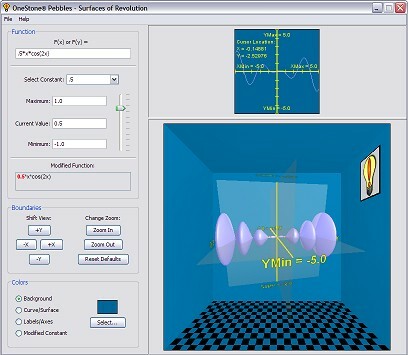 The Surfaces of Revolution Pebble provides a high-quality visualization for what is often perceived to be one of the more difficult topics in the calculus syllabus. The 2D display shows a user-defined 2D curve, while the 3D display shows the surface created by rotating the 2D curve about an axis. The curve and surface can be animated by varying any constant in the expression, as described on the Using Pebbles page. Functions in which X is the only independent variable are drawn in the 2D Graph as the curve Y = F(X). This curve is then rotated about the X axis to form the surface shown in the 3D graph. Functions in which Y is the only independent variable are drawn in the 2D Graph as X = F(Y). This curve is then rotated about the Y axis to form the surface shown in the 3D graph. Click the 'Launch...' link below to start the Surfaces of Revolution Pebble. The process of installing and running a Pebble for the first time is explained on the Installing Pebbles page. Running one after the first time is quicker: the JOGL package doesn't have to be downloaded, plus something other than the generic 'Starting Java' image is displayed during start-up. A special thanks to Dr. Bryan Shader of the University of Wyoming for suggesting this topic. Launch the Surfaces of Revolution Pebble.